Somehow today I ended up on @Carmendrahl‘s old blog and found this post on Kugelrohr distillations (“The tastiest distillation there is”). I have spent the last year doing regular distillations and kugelrohr distillations because my crappy water soluble, highly polar, small compounds are a nightmare to purify. Although I do love a kugelrohr distillation, my life saving (and by that I mean post-doc saving) piece of equipment this year has been the Soxhlet extractor. Unlike the kugelrohr apparatus, the Soxhlet was named after someone and that someone was Franz Ritter von Soxhlet, an agricultural chemist from Germany. 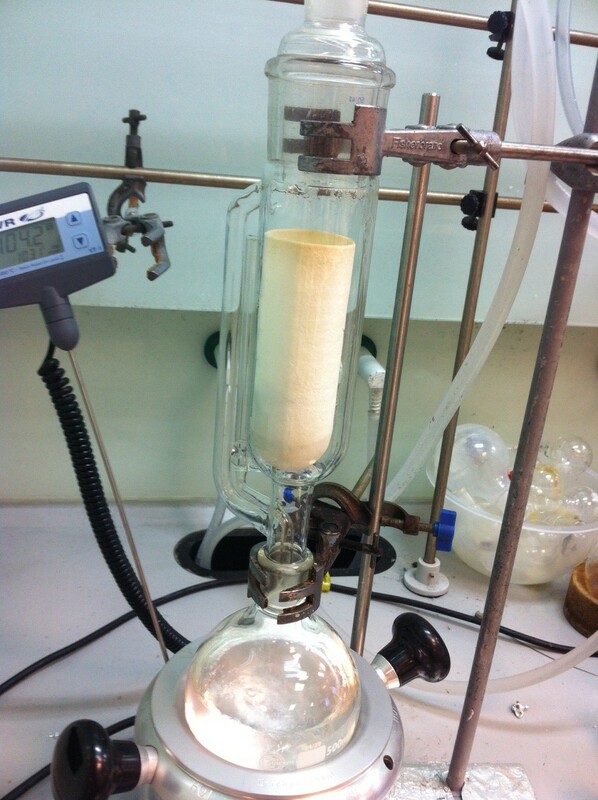 I use Soxhlet extractors to extract my precious product from a solid because I can’t use aqueous extraction methods. I put the solid from my reaction (usually a reduction using LAH) in to the filter paper-like “thimble”. THF is then put in the round bottom flask and heated up so it boils. The THF is then condensed into the thimble using a condenser. When the thimble is full, it drains back down in to the round bottomed flask and the process repeats. Any one that follows me on twitter will know that I am frequently mesmerised by this process. You can see it for yourself on the multitude of youtube videos. I should also say that @SellaTheChemist does a much better job of explaining this over at his RSC Classic Kit blog. Today is my official last day of my current postdoc so I thought I would celebrate the piece of equipment that got me though. Thanks Franz Ritter von Soxhlet for making this postdoc more than bearable! My desk – is it normal? A bit of a random post today but I was just wondering what your working environment is like? How cluttered is your desk? Do you have something special/different/odd on it? Do you even have a desk of your own? My laptop, unsurprisingly, with headphones and mouse attached. A to do list which I re-do every Friday, after hopefully crossing most of the week’s planned work off. Clayden aka “The Green Bible” – The organic chemists must have text book. So do share…what is on/in your desk? P.S. If you haven’t already, head over to Stu’s blog, Chemical Connections to check out his latest twitter elements post. It is already my favourite blog post of 2013.